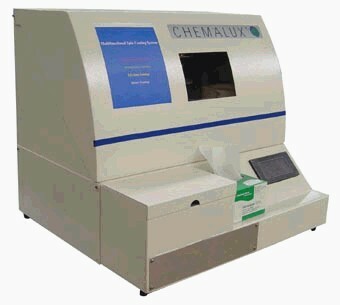 The Chemalux 100 Spin-On Multifunctional Coating Systems are designed to enable optical stores and wholesale labs to enter the high profit, high growth market for multifunctional coatings (SR, AR, Mirror and EZ-Clean). The 100 system is a bench top machine which only takes 16" x 21" (40 cm x 53 cm) space, easily fitting into stores and labs. The simple and reliable electromechanical structures make system easy maintenance and repair. The PLC control systems integrate automatic high pressure water wash with precise spin-on coating. The systems apply the coating one surface at a time, lens by lens. Each functional coating is produced with a finger of touch.